A beautiful mess | Pasta & Co. Looking in your pantry and desperately in need of an idea to get rid of all those pasta leftovers, which you won’t cook because they’re all different and don’t even make a portion? Try this empty-the-pantry baked messy pasta, which features meat sauce, béchamel and any extra cheese and ham you have in the fridge. Gather your pasta leftovers, take an oven-to-table roasting pan and pour them in it to take measurements. Half your roasting pan will be enough. See the recipe for an 8×10 pan, which is enough for four people. A) Prepare the glorious Italian Ragù. In 1 hour and 1/2, you’ll get a lovely thick rich meaty tomato sauce. Spice it with a pinch of nutmeg and put it aside. See the recipe here. B) Meanwhile, prepare the béchamel sauce. Scald the milk. Meanwhile, melt the butter in a saucepan over low heat. Next, whisk in the flour and stir continuously for 5 minutes. Pour the hot milk into the saucepan and whisk constantly so that you can work out the lumps. Increase the heat to medium and stir until you get a smooth, thick sauce. Add grated Parmigiano, nutmeg and salt to taste. Put it aside. 1) Cook pasta in salted boiling water. Consider the cooking time on every box and make an average of all the cooking times. For instance, today I had Farfalle (11 min), Penne Rigate (12 min), Paccheri (15 min), Cavatappi (6 minutes) and Spaghettini (7 minutes). I cooked Farfalle, Penne and Paccheri in one pot for 13 min. And I cooked Cavatappi and Spaghettini for 6 minutes in another pot. Pasta will finish cooking in the oven. 2) Preheat the oven to 395 degrees. 4) Take your oven-to-table baker. Begin to layer meat sauce, pasta, béchamel, grated or finely sliced cheese and a few slices of ham. Then again pasta, meat sauce, and coat evenly with béchamel. Sprinkle with grated cheese and finely grated breadcrumbs. 5) Bake the pasta until you see a golden crusty gratin. 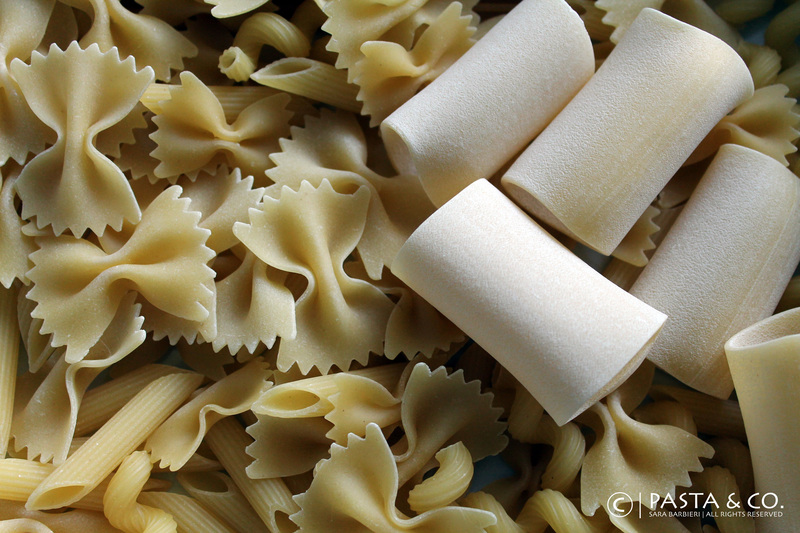 6) Remove from the oven, wait about five minutes for the pasta to cool down. Cut in four portions, use a lasagna lifter or a turner to plate them up and enjoy!